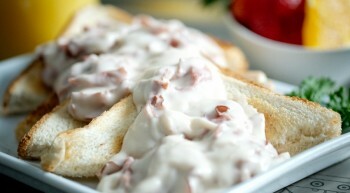 Vanee Creamed Sliced Beef is a hearty breakfast staple made with thinly sliced dried beef in a buttery white cream sauce. 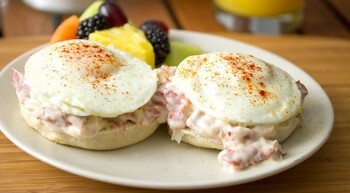 Great over toasts, bagels, or biscuits. 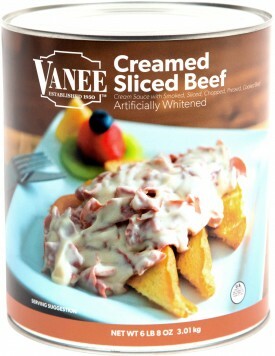 Vanee Creamed Sliced Beef is shelf stable for easy storage. Each 106 oz. can has 24 single cup servings, for a total of 144 servings per case. Serve over toast, bagels, or biscuits. Water, Smoked Beef Strips (Beef, Water, Salt, Sugar, Corn Syrup, Flavorings, Sodium Nitrite), Food Starch - Modified, Cheddar Cheese (Milk, Cheese Cultures, Salt, Enzymes, Calcium Chloride), Butter (Sweet Cream, Salt), Cream, Sugar, Palm Oil, Titanium Dioxide, Sodium Phosphates, Hydrolyzed Wheat Protein, Maltodextrin, Disodium Inosinate, Disodium Guanylate.